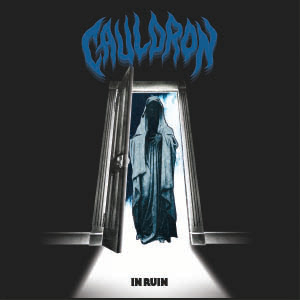 CAULDRON Streaming New Track "Empress"
Canadian trio CAULDRON are streaming another track, “Empress”, and you can check it out below. The track is from the group’s upcoming fourth studio album, In Ruin, due out January 8th via The End Records (out in Europe January 29th via High Roller Records). About the new album artwork, Jason Decay recently said: "We wanted a basic, straight to the point cover without going totally METALLICA Black Album; something that catches your eye when flipping through the record bin. I saw a decrepit and eerie looking statue hovering in a doorway upon the In Ruin title. We expressed this to our friend Squid (who did the artwork) and I guess you could say its a cross between Poltergeist, Alice In Hell and Intravenus de Milo?!" For the new album, the trio returned to the Lincoln County Social Club recording studio in Toronto, where they recorded two of their previous albums, including Burning Fortune (2011), and Tomorrow’s Lost (2012). Co-produced by Chris Stringer (RUSH, TIMBER TIMBRE), In Ruin is sure to deliver more riffs, more attitude and more modern heavy metal classics while laying waste to all of the genre's imitators. 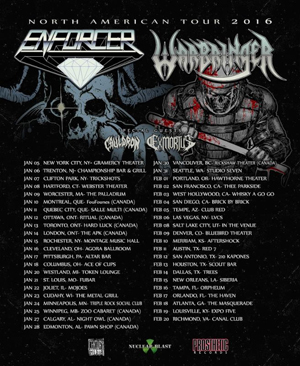 To celebrate the album release, CAULDRON is set for a North American tour with ENFORCER, WARBRINGER and EXMORTUS January-February 2016.